When Lugne Mocumin decided to serve with St. Columba in his mission to spread Christianity to the Picts of Northeast Scotland in the middle of the sixth century, he may have gotten a little more than he bargained for. While on its way to visit with the leader of the Picts, a fellow by the name of Brude, the missionary party headed across Loch Ness. 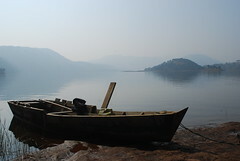 During the trip, the missionaries spied a group of men on the shore engaged in burying a fallen friend, a victim of the ferocious beast that lived in the depths of the lake. Naturally Columba wanted to help in some way and so he ordered Lugne (who truthfully no one in the group really liked that much anyway) to swim out to retrieve the victim’s abandoned boat. 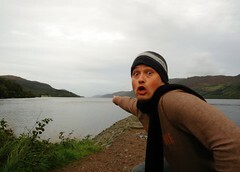 Not surprisingly the monster of Loch Ness rose up to attack, but Columba was prepared for that. He calmly made the sign of the cross and said: “Thou shalt go no further, nor touch the man; go back with all speed.” At these words, the monster shrugged and swam away with his serpentine tail between his flippers. This is the earliest known record of the famed Loch Ness Monster and it comes from Adomnán, the 9th Abbot of Iona who wrote his account about a hundred years after the alleged event. That Adomnán’s distance from the event should be considered when determining the reliability of his account is something even most Nessie enthusiasts (sometimes known as “crazies”) will grudgingly admit. But the same problem can’t be attributed to the next reported appearance of the monster. After Columba it seems no one heard a peep from the fearsome creature of Loch Ness until just eighty years ago on May 2, 1933 when the Inverness Courier broke the story that a couple of highly reliable witnesses driving a newly completed road along the lake edge had seen, well, something. The report attracted a great deal of interest (mainly from “crazies”) and soon big game hunter Marmaduke Wetherell was on the job. Hired by the London newspaper Daily Mail, Wetherell soon discovered a set of large footprints. Unfortunately for Wetherell and monster enthusiasts everywhere (still known up until 1959 as “crazies”), the prints belonged to a hippopotamus foot umbrella stand. Shamed by the exposure of the hoax, Wetherall didn’t give up there and in April of 1934, Colonel Robert Wilson, a respected British surgeon, took a stunning picture of the beast, or perhaps of an otter, or maybe a log. The picture, though hardly conclusive evidence of the presence of a lake monster, appeared authentic and it wasn’t until 1994 that the photo was entirely exposed as a hoax perpetrated in part by Wetherell. 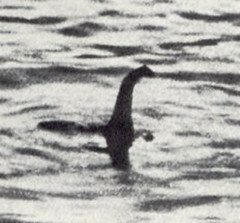 With the exception of a few cryptozoologists (a term coined in 1959 because nobody could get “crazyologist” to stick) who don’t find this whole hoax theory at all credible, the world was shocked when it was revealed that instead of a genuine lake monster, the picture actually showed a plastic mold mounted on a toy submarine. I would love to go sometime and when I do, I’ll be on the lookout. I think it is the all-consuming obsession rather than the mild curiosity that makes one a crazy. We have to remember, there is always a little truth in the myth. Ancient Greecian stories of wild monsters of the land and see, Argonauts, and such have mythical creatures. Think about it like this, how would you describe an animal that was extremely tall, dark orange in color, had large blocked markings, seemed to have multiple legs and and long necks with small heads at the top? To us, today, it is a herd of giraffes, but back then they had never seen such a creature and your stories had to be bold and filled with danger to make you look smart and strong to win the favor of the wealthy to support your travels. The golden fleece, more than likely could have been a lions mane. The hydra, a group of giraffe standing together. The Kraken, a giant squid, that had found it’s self in the smaller and shallower waters of the local seas and praying on the local sealife. Remember, the ships then were much much smaller than they are today. Holding only 25 men to the maximum, no hull to sleep in, all slept on deck, and heavy currents and light winds could carry you far beyond your known lands. This is why I believe there is some truth to the loch creature, the bigfoot, the yeti, giant squid, and various other tales, because it is possible, maybe not as exciting as the exaggerated tales of the past, (with romanticized details) but they do exist.